Homeownership is part of the American dream, but buying a house today is not what it used to be. Fortunately for modern homebuyers, there are many nonconventional ways to become a homeowner. When you think outside the box, home buying becomes more customizable and attainable than it’s ever been. Purchasing a property that can produce an income through rental can greatly increase your buying power. This is especially beneficial if you want to purchase in a very trendy neighborhood where home prices are inflated. A duplex gives both parties relatively equal living space and you may be able to charge the renter up to half of your mortgage payment to ease your financial burden. If you’re not looking to sacrifice your own living space for income, look for a property that has a basement unit or a garage unit that can be rented out. Your income from the property will be less, but still a relief financially. If you’re looking to invest in a home that is currently outside of your budget, then an income property might be right for you. Are you familiar with the television show “Tiny House Nation”? Then you know there is a nationwide movement toward the minimalist lifestyle. 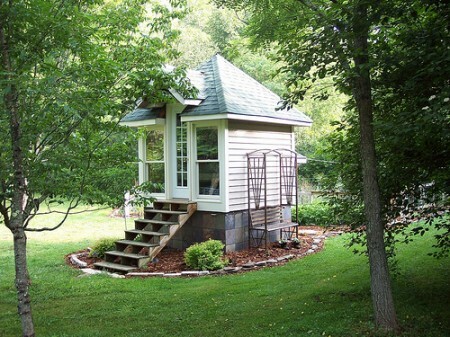 Tiny houses are not just for first-time homebuyers. In fact, many tiny homebuyers are downsizing from a traditional home to free themselves from the financial strain of a large mortgage payment. Tiny houses can be custom built on mobile platforms, be permanent structures built like a regular house or tiny condos in a city. The roughly 200- to 500-square-foot floor plan forces the owner to be innovative with space-saving ideas, and often most pieces of furniture serve double duty. If you’re looking to live a minimalistic life with a tiny mortgage, then a tiny house might be right for you. Housing co-ops are similar to condo-style living, but the rules that govern the group of inhabitants are different. Instead of being a traditional homeowner and owning the unit you live in, you are a member of a co-op association. The association owns the building and all the units. The resident is a shareholder. Co-op members get tax deductions similar to regular homeowners. If you’re looking to be treated like a homeowner without taking out a mortgage, co-op membership might be right for you. Modular homes, or houses built in a factory and then moved onto a building site, have many of the same benefits of a stick-built house but are often much cheaper (and greener). Modular homes are not mobile homes even though they are transported, and they do not depreciate in value like a mobile home. Because these homes are built indoors, factors like weather do not impede the building plan. The efficiency of the build is what saves money over a stick-built house. If you’re looking for a traditional home at a cost savings, a modular home might be right for you. You’ve found your dream home but you’re just not quite ready to get a mortgage. Maybe you haven’t saved up enough for the down payment or you’re working on bringing up your credit score. Rent-to-own is a way to move into the house you want before you purchase it. This method is more beneficial that renting a property that is not for sale, because a portion of your monthly payment goes towards the purchase price of the house. You’re not just losing money every month on rent, you are making an investment. If you’ve found your dream home just a bit too early, then rent-to-own might be right for you. Using owner financing is an option to purchase a home without going to the bank. This occurs when the owner is willing to accept payments directly for the home instead of requiring a lump sum from the bank. This works when the current owner owns the house outright and is not currently paying a mortgage or is able to carry multiple mortgages at once. A similar approach is when the buyer assumes the mortgage from the seller. The buyer takes over making the mortgage payment for the seller. Often there is a lump-sum compensation, less than the total cost of the home that the buyer pays to the seller. This works when the seller still has a mortgage payment but may not need to purchase another house right away or can carry multiple mortgages at the same time. If you are trying to avoid the mortgage broker all together, owner financing might be right for you. There are even more nonconventional ways to become a homeowner than the six listed here. Think outside the box and you will be able to make your American dream of becoming a homeowner come true.